“We have selected the theme of celebrating South African legends to honour not only this year’s selection of winners, but also the long legacy that comes with our awards,” says Marcus Desando, ACT CEO. While the Arts & Culture Trust has many different programmes that aim to better the South African arts and culture landscape, the ACT Awards are seen as its flagship event and ACT has therefore decided to change the format of this year’s awards to a talk-show style presentation to achieve a more intimate knowledge of the winners and the impact that they have had on our sector. Furthermore, ACT will be selling tickets to the general public so that they can share in this momentous event. Literature (sponsored by Dramatic Rights and Literary Organisation [DALRO]) James Matthews. Tickets are limited so make sure you get your ACT AWARDS 20th Edition celebration ticket here. The Arts & Culture Trust would like to thank all the sponsors that make this event possible. Further details about the Lifetime Achievement Award Winners will be released in the following weeks. 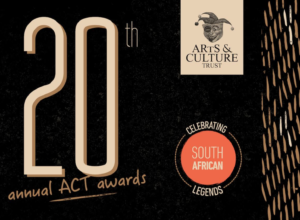 The 20th annual ACT Awards is hosted by Sun International and are supported by the Southern African Music Rights Organisation (SAMRO), the Dramatic, Artistic and Literary Rights Organisation (DALRO), the Nedbank Arts Affinity, JTI, and Creative Feel Magazine. The Arts & Culture Trust (ACT) is South Africa’s premier independent arts funding and development agency. The primary aim of ACT is to increase the amount of funding available for arts and culture initiatives, and to apply these funds to innovative, sustainable projects that make a meaningful contribution to society. Through structured funding and development programmes, ACT provides support for all expressions of arts and culture, including literature, music, visual art, theatre and dance, and the support extends to festivals, community arts initiatives, arts management, arts education and arts administration. Follow ACT on Twitter or like the Trust’s Facebook page or visit www.act.org.za. The Sun International Group has a diverse portfolio of assets including world class five star hotels, modern and well-located casinos, and some of the world’s premier resorts. Their destinations offer experiential luxury, enduring quality and incredible adventure, supported by an authentic dedication to personal service. Sun International Group’s approach has been to differentiate their hotels, resorts and casinos in architecture, service, experience, location and the mix of entertainment and activities. Creating lasting memories for their guests and customers is a core part of their DNA. They’ve created some the world’s most iconic hotels ranging from the latest addition to the group’s properties Sun Time Square, to The Palace of the Lost City at Sun City and The Table Bay Hotel in Cape Town. The Group places a strong emphasis on being responsible corporate citizens through their contributions and commitment to the economy, communities and the environment. They are committed to the development of all their employees and they make sure that equal opportunities and economic empowerment form the backbone of their human resource practices. For more information, please visit www.suninternational.com/. The Nedbank Arts Affinity is a proud supporter of The Arts & Culture Trust (ACT). 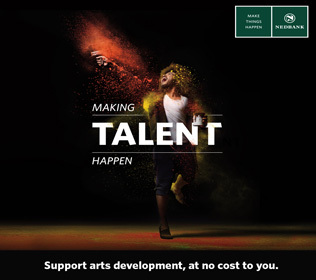 Since the inception of ACT in 1994, Nedbank has raised and distributed more than R16 million through its Arts Affinity Programme, in support of more than 800 South African arts, culture and heritage development projects, at no cost to their clients. To open a Nedbank Arts Affinity account please visit any Nedbank branch or call 0860 555 111, or visit nedbank.co.za more information. DALRO is a multi-purpose copyright society that collects royalties for the use of copyright-protected works on behalf of authors and publishers, which it then distributes back to the correct copyright-owner. As a custodian of copyright and the protection of rightsholders’ works, DALRO’s main areas of administration are reprographic reproduction rights (photocopying from published editions), public performance rights (including stage rights for book musicals and dramas) and reproduction rights (whether for publishing or copying) in works of visual art. DALRO is celebrating their Golden Jubilee this year. For more information, please visit www.dalro.co.za. SAMRO was established in 1962, with the key objective to protect the intellectual property of its composer, songwriter, and publisher members, the organisation’s primary focus is to administer the various music rights of Copyright on behalf of writer and publisher members. The collecting society, as it is known, is mainly concerned with the collection of license fees for the use of its members’ musical works by various music users, the distribution of royalties to these members, and the promotion of Copyright law. Visit www.samro.org.za for more information. Japan Tobacco International (JTI) is a member of the Japan Tobacco Group of Companies (JT), a leading international tobacco product manufacturer. Headquartered in Geneva, JTI operates in 120 countries and has over 26,000 employees. For more information, please visit www.jti.com. Creative Feel Magazine is an award-winning monthly arts and culture magazine that brings the best in classical and jazz music, dance, visual arts, film and theatre, as well as food and travel, to its readers. The magazine is dedicated to promoting arts and culture in South Africa. Creative Feel Magazine has garnered many prestigious awards, including Arts & Culture Trust (ACT) Awards, as well as the SAPPI PICA Award for excellence in publishing and the coveted BASA (Business and Arts in South Africa) Award. For more information, please visit creativefeel.co.za.